Vazhaipoo Masala Vadai is also known as Aamai (tortoise) vadai. I don’t know why it got such a name. 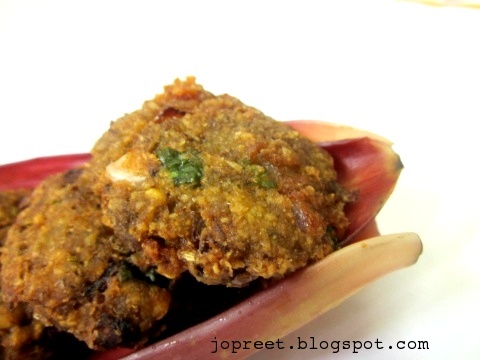 One of my favorite vadai, for which i used to fight with my brother. Reminds me of silly childhood days 🙂 You would surely like it than other varieties. The only part which takes more time is cleaning of banana flower. Otherwise, it is worth to try this. Cook the finely chopped banana flower in water for 10 mins. Allow to cool and drain the water. Blend it in a mixer without adding water. It should not be watery. 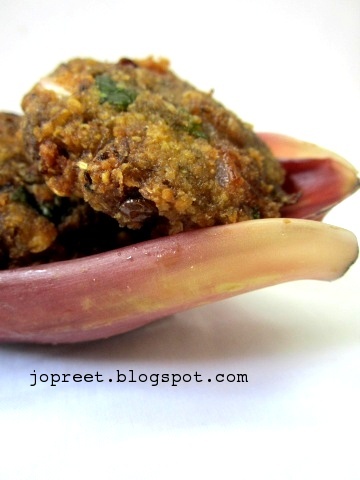 Blend the soaked bengal gram along with fennel seeds in a mixer to paste. Add water if needed. Mix banana flower paste, finely chopped onions & green chilies, chopped garlic flakes, grated ginger, chopped coriander and curry leaves with the bengal gram paste. Add salt to taste and mix all. Keep it aside for 10-15 mins. Heat oil in a pan or kadhai. Wet your palms and make balls of the paste. Take a ball and make small disc. Drop it in the oil and fry till it turns golden brown and crispy too. Fry all the vadai and drain the excess oil using absorbent tissue paper. Serve hot with chutney or sauce. 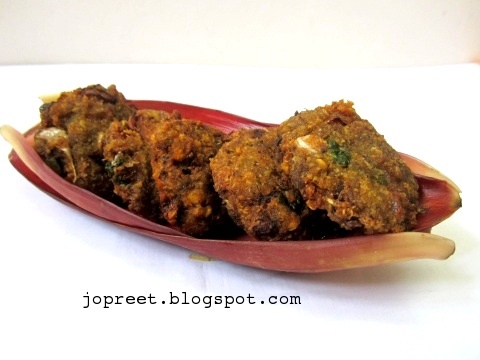 crispy n yummy vada, i too make it similar way, lovely presentation! Delicious and crispy vadai. Love to have it with tea. Never tasted these.. look so yummy. Feel like munching this super crispy vadas,yummm..